Victorias Corner: How High is Too High for Your TV? Had an interesting thought today when looking through house articles. How high should your TV be mounted? Nielson Co. reports that 96.7 percent of homes in the U.S. have television sets. I would venture to say that most homes have at least two to three TVs. Often a big decision when designing a living space in a new home is where to place or hang the TV. Should it be a focal point, should it be just accent or left out all together? Remember you can use apps to play photos on your TV and turn it into a rotation piece of art work. So, there is one general rule that you should follow when mounting or placing your TV; the ideal center of the screen should be at eye level for the viewer. To find this number, you may have to do some math but if we use averages then the average height is around 42 inches for viewers seated on a couch. In turn, optimum viewing distance from the set has been 2.5 times the diagonal length of the TV screen historically. But with the advent of larger and larger screens, viewing distance is not as critical as it used to be. I would consider the age of viewer. Usually as you get older, it is nicer to have a larger screen to view. If you select a 60-inch TV which is around 32 inches high, the ideal center is 16 inches from the bottom. Eye height for a relaxed adult viewer would be about 24 inches above the seat on the couch. Which puts your optimum viewing height at 42 inches, so your 60-inch TV would be installed 26 inches above the floor. Now, there are lots of parameters to consider when mounting a TV. Is it the only one, is it your main set, what position will most of the viewers be in when they watch, etc. 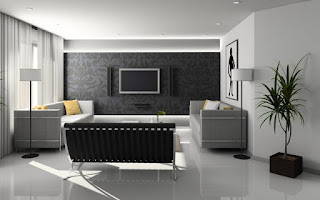 Main sets should be set up for more optimal viewing but smaller sets over bars or in kitchens or even in bedrooms have different requirements. Will the viewer be standing or laying on the bed? Playing a game or using a pillow? A lot of newer construction places TVs over the fireplace but fireplaces don’t look like they used to. A lot of newer fireplaces are gas and are linear in design as opposed to an open hole in the wall that you throw wood into. However, it is your home and whether the TV is your focal point or just an accent piece, it is your decision on where to place it. If you do plan on placing it above the optimum viewing height, consider tilted the TV at a downward angle so your perception will be closer to an optimum angle. The worry is straining your neck by always looking up which is funny since most of us are always looking down at our smartphones. Conclusion, in today’s society, try to think about the health of your neck. I hear a lot about how people are visiting massage experts and chiropractors with neck injuries that have resulted “tech neck”. Here are five exercises you can use to combat this issue. All of these movements should be slow and controlled and done about 10 times twice a day. These movements help to improve the muscle imbalances that are caused by sitting behind a computer or staring down at our smartphones for hours at a time.